Seoul’s Cheonggyecheon stream, designed by SeoAhn Total Landscape. Being a tourist in any city can be as exhausting as it is inspiring. Particularly when you don’t know the language and it happens to be one of the world’s great megacities. On a recent trip to the South Korean capital Seoul, mental exhaustion and sore feet were tricky to avoid. 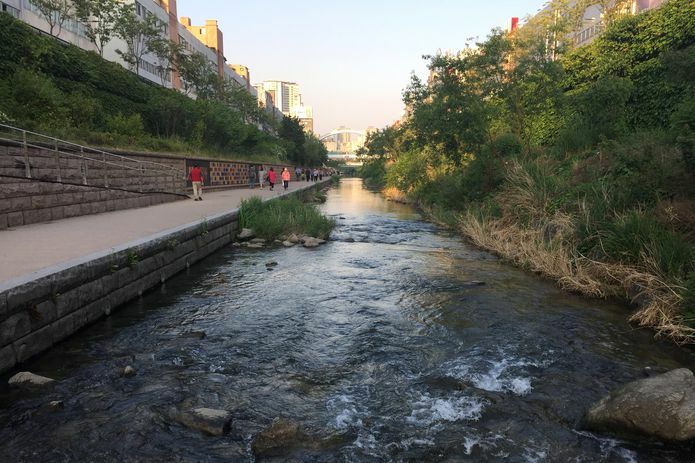 There were many reasons that brought me to Seoul and one of those was to visit a project that is often held up as a twenty-first century planning poster child – the Cheonggyecheon Stream Restoration Project. 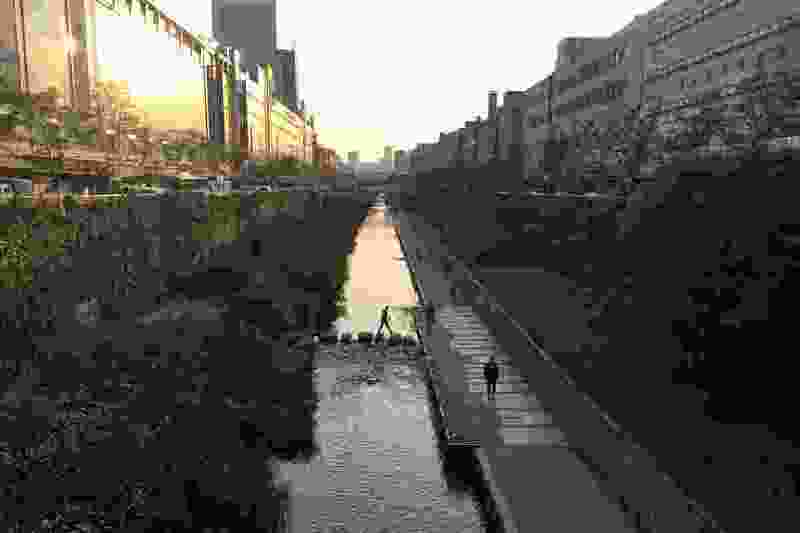 Opened in 2005, the project “daylighted” a neglected watercourse in the centre of the city that was previously covered over by an elevated highway, and prior to that, was basically an open sewer. The 1970s highway, which was ageing and in poor condition, was not replaced by another highway elsewhere, or even a road tunnel – it was simply deleted from the city’s road network and replaced with a human-orientated, ecological project that has significantly changed the face and psyche of Seoul. And despite fears of traffic Armageddon, removing the roadway from the map didn’t grind Seoul to a halt. Sitting beside the stream a sense of calm creeps in. 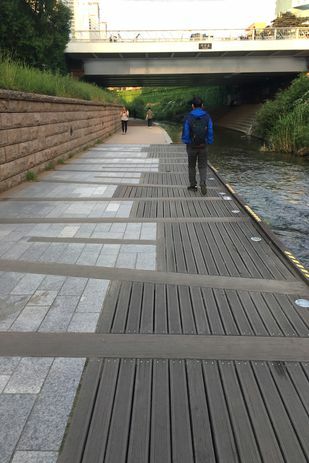 It’s not an immediate feeling – there are still the sounds of the city all around, but they drop a few decibels as you descend down to the water’s edge, away from the traffic. 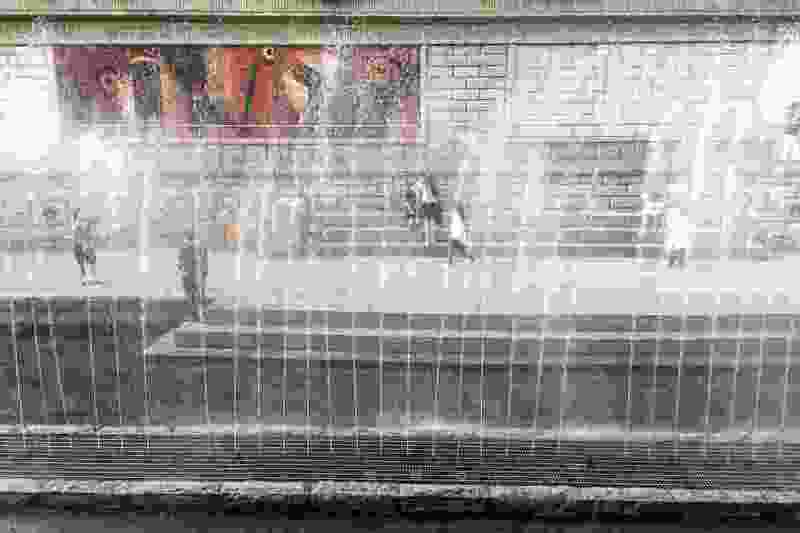 The sound of water places a subtle soothing filter over the remaining urban hum. Although I didn’t see anyone else doing it, I couldn’t resist taking off my shoes and submerging my tired tourist feet in the cold water. To be afforded this luxury in the centre of a megacity felt incredibly odd, but very welcome. I sat and watched a steady stream of foot traffic along the pathway across from where I sat, made up mostly of hand-holding couples, tourists with cameras and families with small children. The section I visited, designed by SeoAhn Total Landscape, was finished in stone, timber decking, natural boulders and concrete pathways – an understated palette that doesn’t seek to compete with the novel beauty of the born-again steam. A thick blanket of ivy covers the southern wall up to street level, and opportunistic grasses have taken on a sense of weedy wildness along the terraced banks. The city of Seoul has undergone a staggering transformation in the past sixty years and attitudes to public space are constantly evolving. 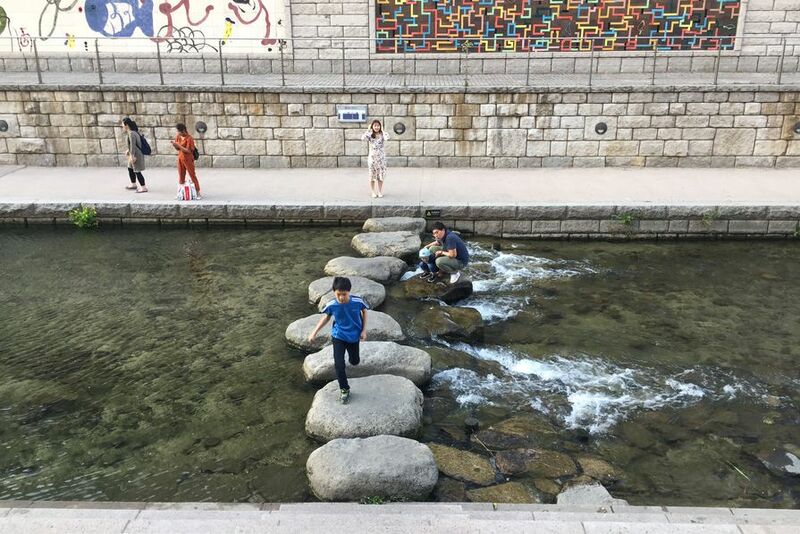 If you consider that in just one generation, South Korea leapt from one of the world’s poorest countries to a developed, high-income country, young people in Seoul today have a very different perspective and relationship to the city and public space than their parents and grandparents. While not without its flaws, this project serves as a shining example of why we should always question the function of new and existing infrastructure in our cities.